2019 CNRA State Championships - Congratulations to the CNRA State Champions! 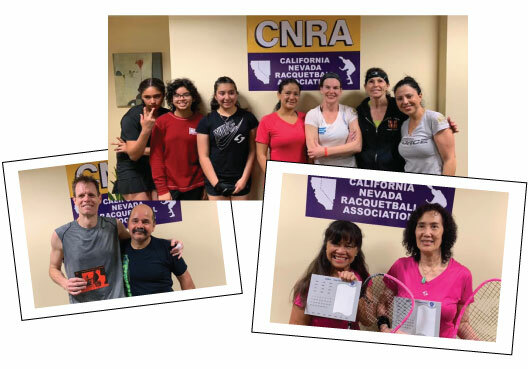 Congratulations to all the participants of the CNRA State Singles/Doubles Championships held this weekend at the Meridian Club in Fullerton, CA. Victor Rodriquez was a gracious host and Dorcy Norton an awesome tournament director. A special thanks to all of those who lent their assistance throughout the event, you know who you are!!!! All of the results can be found at, https://www.r2sports.com/tourney/home.asp?TID=30529, and enjoy the photos posted to the CNRA Facebook page. This year the USA Racquetball Junior Olympics (aka Nationals) were held in Des Moines Iowa. These were held June 21-24th at the downtown YMCA, a very nice facility. There are 8 courts, all with glass backwalls, and with two having bleachers set up behind. Despite it being a long trip for California players, we had almost 40% of all of the players there (56 out of 141). Play started early and went late every day, but always on time if not running early. When it came to finals time, California was well represented with 9 players qualifying for Team USA, World Cup (18s, 16s and 14s) and Esprit (12s and 10s). Many of these players qualified for both singles and doubles…A list of these players can be found below. The annual Saturday night banquet was a packed room. Lots of acknowledgements, but the usual highlight is the awarding of the players of the year. The girls Esprit player of the year was Sonya Shetty from Fremont. Receiving the special Sportsman of the Year award was Ricky Diaz from Stockton. At the banquet, we attempted to get all California players in a picture. As many scrambled the minute the banquet wrapped up, we were still able to get a fair amount. Lots of great finals matches on Saturday and Sunday. Fitting that the last match of the tournament was the Boys 18 and under final pitting NorCal (Ricky Diaz) versus SoCal (Dane Elkins). It was a tough match, but Ricky was in a zone winning in two games. His brother, Jose, is a previous winner of the 18 and under. Another great event. Right now it has not been announced where the next one will be, but we are told this will be announced soon. Our mission is to perpetuate, improve, promote and expand the sport of racquetball in California and Nevada. Our Election Committee is accepting applications for candidates who will be actively involved in the Mission of the CNRA by serving as a Board of Director. This job is your opening to use your leadership skills to have an impact on the opportunities and challenges our sport faces. Please submit your Board Candidate Statement of Interest, 200 words or less, to rantilla@verizon.net, or mail to Ruben Antilla/CNRA, 1563 Sycamore Ct., Banning, CA 92220 to be received not later than 5:00pm, Tuesday June 19th, 2018. The Election Committee will review submissions and put together a slate of candidates. Candidates will be notified on or before June 27, 2018 of their acceptance. Should you not be included on that slate of candidates you will be notified and afforded the opportunity to petition the board to be added to the slate. You must have previously submitted your Board Candidate Statement of Interest by the June 19th deadline to afford yourself of the petition process. The petition forms will be provided with instructions and will be due back to the Election Committee Chair by July 27, 2018. Voting for the Candidates will take place approx. August 13 – September 2, 2018. Results will be announced mid September 2018. As you prepare your written Statement of Interest, please keep the criteria noted below in mind so that the Election Committee can best assess our candidates. This is similar to a racquetball resume with examples of your experience matching up to the criteria we are seeking. The Board is looking for members who will support the Mission of our association and strengthen our organization’s governance. Leadership skills in program development to promote growth in the recreational player, junior, high school & Collegiate areas are highly desirable. Committee participation is a substantial portion of this Board’s activities pertaining to Membership development, Communication, Media Utilization, Fundraising, Achievements & Acknowledgments, and Event Collaborations & Board Governance. Participation in monthly conference calls and bi-annual Association face-to-face meetings is expected. Applicant must be willing to be highly visible advocates for racquetball in word and deed and be prepared to identify potential conflicts of interest. Must maintain a current USAR membership, and be a resident of California or Nevada. 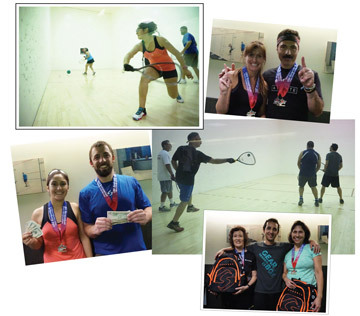 Stockton was the site of the recent CNRA State Singles and Doubles and was also designated as a qualifying event for the USA Racquetball National Singles to be held in our own backyard, Pleasanton, CA, May 24-27. Tournament Director John Ellis and his group of fantastic volunteers did an outstanding job hosting this event from start to finish. Kudos to all!!! Congrats to all of the players and especially those crowned as our State Champions! Click here, http://www.r2sports.com/tourney/viewResults.asp?TID=22265, to view the results. Now is the time to register for the USA Racquetball National Singles, http://www.r2sports.com/tourney/home.asp?TID=21878. I've been a participant for the past 4 years at various tournaments including Junior Nationals and the US Open. Last week, I accompanied my son Bryan to his first High School Nationals. There were 347 Players from 9 different states that competed in Portland, Oregon. The most players came from Oregon (176) and Missouri (141). California brought 12 Players (8 Nor Cal and 4 So Cal). Out of the 33 Boys in the highest #1 Gold Bracket, 5 Cali boys made it to the top 9. There was an all Cali boys final featuring Sebastian Fernandez winning 1st (San Ysidro) and Antonio Rojas 2nd (Stockton). On the girls side, Nakita Chauhan from Nor Cal was a finalist and took home the silver medal. The boys doubles gold medal was won by brothers Antonio and Jesse Rojas (Stockton). Overall it was a great tournament, 5 long days of non-stop high school racquetball action. I enjoyed hanging out and watching all the kids play. 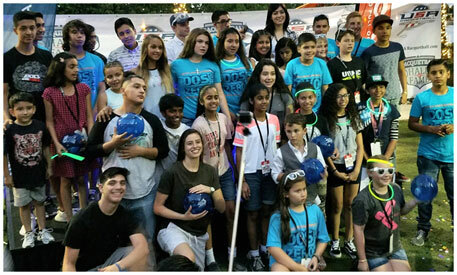 Attending the tournament has inspired me to help promote junior and high school programming. Exposing the younger generation to racquetball is essential for continued growth of our sport. A special thank you to the coaches, parents, players, sponsors, volunteers, and USAR Staff. CNRA Junior State Championships A Huge Success! The California Nevada Racquetball Association (CNRA) Junior Championships took place January 20th at Primetime Athletic Club in Burlingame. It was a full day of play with over 70 players attending from across the state. This is the largest turnout for a Junior State Championship we have had in many years. Jazmin Trevino, our tournament director, made sure players and referees were at their courts. Heather Mahoney and Dane Elkins also helped out at the desk, checking in players, finding refs, handing out shirts, and medals etc. Thank you Jazmin, Dane, and Heather! The day began with the Multibouncers at 8:30am and continued non-stop through the day finishing at 7:30pm. Lunch was sponsored by the CNRA Junior Committee and went quickly. We did a few things differently this year. Annually, the CNRA Board looks to assist players attending the Junior National championships. This year, only players attending this event (State Championships), are eligible for this assistance. Funds for players will be determined based on number of players attending Nationals and funds available. For the 18 and under, Boys and Girls, there was $1,200 offered as “Junior National Scholarship”. These funds are to be used to offset expenses in attending the Nationals to be held in Des Moines, IA this year. As there were no girls signed up in the 18 and under, these funds were allocated to the boys division only. The top 6 players were awarded, 1st – Dane Elkins ($400), 2nd Antonio Rojas ($300), Semis Ricky Diaz and Sahil Thakur ($150 each), 5th and 6th Ivan Hernandez and Bryan Barbera ($100 each). Thank you to Mike Lippitt and Reaching Your Dream for contributing $1,000 to this event. Thank you to Primetime Athletic Club for hosting this event. 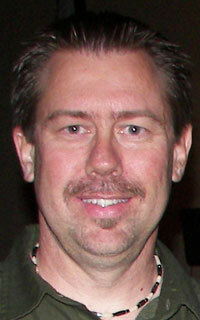 Also, Dave George (Racquetball Director) for helping to set it up etc. Primetime is a terrific facility with 7 courts and a great overall atmosphere. Thank You!!! Thank You to the parents and family members for attending and being supportive of many of the players. Many family members jumped in for reffing duties when needed, which was greatly appreciated. Thank you all for a great event, and looking forward to next year’s tournament (s). If your club would like to host a junior’s tournament, please let us know how we can help. 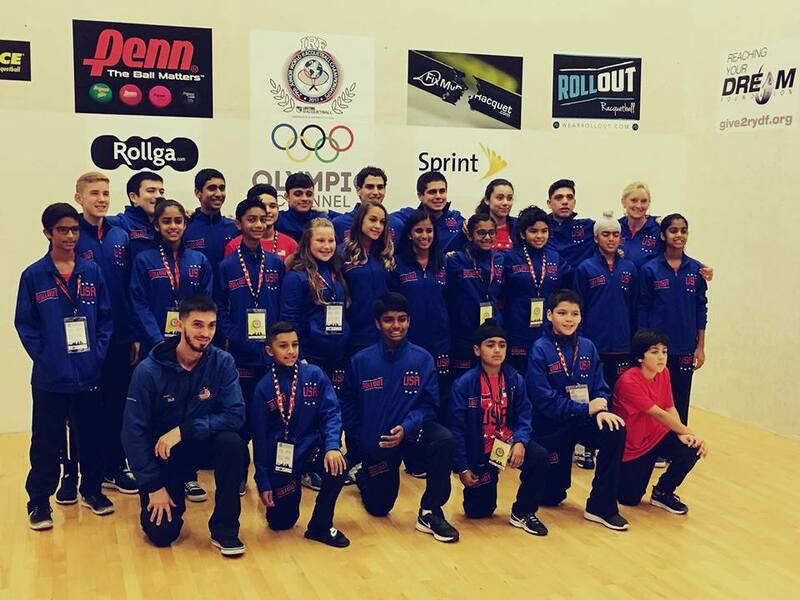 California was well represented at the Junior World championships held November 5th-11th in Minneapolis, Minnesota. This event had players from 13 countries attending. There are two main levels of play, the World Cup (18 and under, 16 and under, and 14 and under) and Esprit (12 and under, and 10 and under). This year the CNRA was able to donate $300 to each California World cup member, $200 to each California Esprit member, and $100 to Non Pt Earners from California. 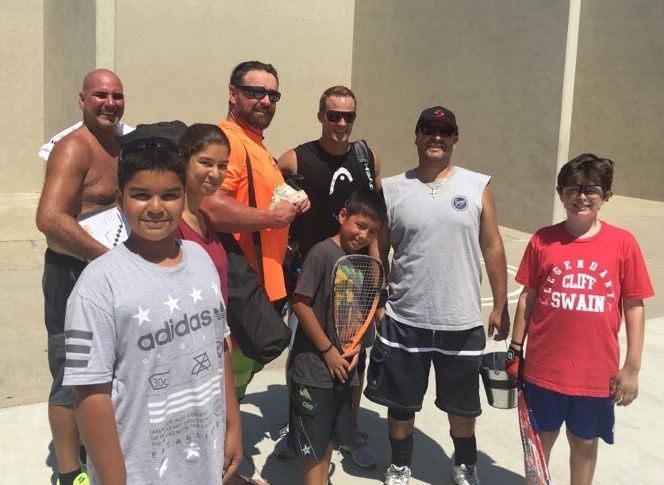 In total the California Nevada Racquetball Association was able to donate a total of $4000 to the participants from our states, and we are very excited to share news about their success. To qualify, the top two finishers at Nationals in singles and the top doubles team in doubles represent Team USA. In Esprit, this is expanded to top 6 singles and top 2 doubles, but only the top 2 singles and top doubles team are point earners for the final standings. There is also the Challenger group which allows players to participate for experience. Esprit – Vedant Chauhan (12 and under singles and doubles); Nikhil Prasad (12 and under singles and doubles – non point); Angel Galvan (10 and under singles and doubles); Eshan Ali (10 and under doubles, 10 and under singles – non point); Bobby Singh (10 and under singles and doubles – non point); Advait Kartik (10 and under singles); Heather Mahoney (12 and under singles); Esha Cyril (12 and under doubles and 12 and under singles – non point); Arya Cyril (12 and under doubles and 12 and under singles -non point); Camila Gomez (12 and under singles – non point); Sonya Shetty (10 and under singles and doubles); Ava Naworski (10 and under singles and doubles); Adriana Perez (10 and under singles and doubles – non point). Most players arrived Thursday to practice ahead of the matches that began Sunday. Saturday night had an Olympicesque opening ceremonies as the countries came out one at a time displaying their flags and team colors. Play began Sunday morning and continued through Saturday. The Lifetime Fitness facility was amazing, but with only 7 courts the schedule was tight and many times an hour or two behind. The kids did not seem to care and when the Sunday night World Cup dinner happened at 11:00ish instead of 8ish, it did not seem to faze anyone. By the time finals were over Saturday, California was well represented in the GOLD. Team USA won 6 GOLD medals with 5 of those represented by California players…Daniel Rojas won the 18 and unders, Antonio Rojas (Daniel’s brother) won the 14 and under doubles with Akul Ramayani. Heather Mahoney won the 12 and under singles. Sonya Shetty won the 10 and under singles. Sonya Shetty and Ava Naworski won the 10 and under doubles. The coaching team was also represented by California peeps. This was an experimental year with Private coaches allowed to work along with the Team USA coaches. Team USA coaches from California…Jody Nance, Bobby Horn, and Robbie Collins. Private coaches – Elaine Dexter, Ken Stone, Brian Dixon, and Anwar Ali. Congratulations to ALL of the players…..
Special Thanks to GearBox Racquetball! The CNRA Board of Directors wishes to thank GearBox Racquetball for hosting a terrific CNRA State Doubles Championships. The one day event was full of lots of racquetball and our State Doubles Champions were crowned. The competition was fierce, the food and awards outstanding, all due to a terrific tournament staff put together by our GearBox sponsor!!! Our hats are off to a job well done and we are looking forward to more of the same. Thanks to our CNRA members the CNRA is proud to announce we will be providing $4000 in financial support to the 18 junior players traveling to the IRF Junior World Racquetball Championships. This prestigious event will be held November 5-11, 2017 in Minneapolis, MN. We wish all the players good luck, play well and have fun!! (Sep 30, 2017) As the presenting sponsor GearBox will host the CNRA State Doubles at the Bay Club in Canoga Park, November 4-5, 2017. Head/Penn also sponsors the event. Please join the GearBox team as the event promises to be fun, exciting, and competitive. Bragging rights as State Doubles Champions are on the line! Enter online at, http://www.r2sports.com/tourney/home.asp?TID=22337. *The CNRA implemented a free starter kit program that included a new Head racquet, goggles, etc. to new junior players who became first-time one- year USAR/CNRA junior. This program was able to provide 45 new junior players with not only a new racquet, but also a membership through the USAR to enter sanctioned tournaments for 1 year. There are a few other states that have implemented this donation program through R2, making the $1 donation mandatory and one state has recently raised it to $2, and they have been able to provide almost full financial support for their juniors programs. In reference to the change in climate, members should be aware that R2 has eliminated the $4.95 fee originally charged to players entering on-line to play in sanctioned tournaments. Members should feel a little better when realizing that the total savings to the R2 player is now $3.95, but further dialog is still needed to achieve full stakeholder success. Board members recognize tournament directors who work tirelessly to showcase the top notch players at their sanctioned events throughout California and Nevada aren’t looking to increase their burden. The Junior Committee agreed unanimously, as did the CNRA board to change the voluntary $1.00 junior donation to a fixed $1.00 minimum donation. You can choose to increase the donation amount but cannot change to $0, to support the CNRA junior programs effective September 1, 2017. We also decided to provide the freedom to any R2 entrant who contests the $1.00 contribution they have made to be eligible for a full refund at the end of the fiscal year, if they write a statement of request to the board. As the world is often subjected to opinionated views, our racquetball community can fall prey to skewed perceptions and misinformed analysis. We have taken the time to make our decision process as transparent as possible, while showing concern to all members of the racquetball community and ultimately sticking to our vision of continuing to grow the sport which does ultimately require some financial support. We look forward to addressing any concerns anyone in our racquetball community would have and look forward to sharing with everyone the results of this decision throughout the year. Again, we want to stress that people have the right to decide what they pay for, whether it’s that $300.00 racquet, $40-100 fee for each division of that sanctioned tournament they entered into, the hotel fees they accrued to stay near the tournament facility, etc. Remember folks, we are talking about $1.00 here to support these kids who have risen to represent the top echelon of Junior racquetball, four quarters to keep families engaged, one George Washington to represent USA racquetball with pride and ultimately – just a buck to keep racquetball alive for our juniors. Rick the Soda Man is our raffle winner for the Vegas warm-ups in Irvine. Small crowd but we raised $50 for juniors that day and Soda Man won $50! A very special thanks to Jesus Ustarroz, Rocky Carson, and Cliff Swain for their support and Daniel Rojas and the Antilla family. 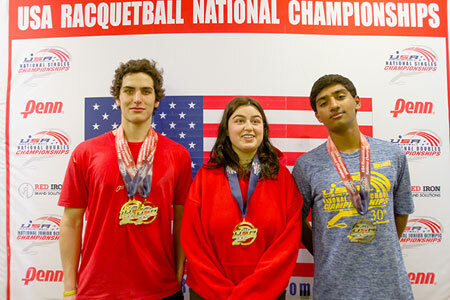 The USA Racquetball Junior country (aka National Championships) were held in Stockton this year from June 21st thru the 25th. There were 183 players from across the country battling for National Championships as well as the honor to be on Team USA for the World Championships. The top two singles players and top doubles team qualify for Team USA. For most of the week temperatures were around 110, with some relief once inside either at In Shape West Lane or In Shape Quail Lakes. Players had a lot of play as most divisions were either Olympic style or Round Robin and most players played multiple divisions. Many finals were completed on Saturday with the remainder on Sunday afternoon. The Saturday banquet has to be one of the best there has been for this junior event. Led by Nick Irvine, it was held outside at the host hotel, University Plaza. Nice buffet line, good seating, and cooperative weather made for a great time. Nick kept things entertaining and moving along. It was announced that the 2018 Junior Olympics will be in Des Moines, Iowa. 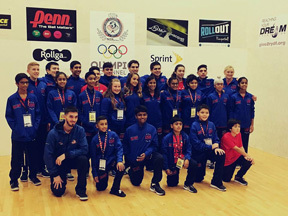 Team California/Nevada is well represented with qualifiers for Team USA with Boys representing in every age division, World and Esprit and Girls representing in every group other than the 18 and under. A total of 11 California players qualified for Team USA World or Esprit! Congratulations to all our CNRA juniors!!!!!! Note: The CNRA provided financial assistance to the majority of the players based on those signing up by the deadline. (May 21, 2017) The 2017 California National Guard Junior Olympic Championships, presented by Penn and Visit Stockton is fast approaching. This event is hosted at In-Shape Health Clubs - West Lane & Quail Lakes. In support of the CNRA juniors attending the National Junior Olympics the CNRA Junior Committee recommended and the board accepted the motion which will honor the first 30 players from California/Nevada to sign up by May 26th $100 to assist with tournament/travel expenses. Once the initial 30 players have been reached additional registrants will be reviewed on a case-by-case basis taking into consideration travel distance. To be eligible players must sign up by May 31st. Also as a reminder the first 100 First Time players (those who haven’t competed in a Junior Olympic event in the past three years) may enter 1 division at no entry cost. Try it, you’ll like it! So.... bring a friend!! To take advantage of this limited special offer, First Time Free entrants must register by May 31st. (May 01, 2017) Are you up for the challenge? The CNRA is looking for qualified and interested candidates to fill 3 vacant positions on the current CNRA Board of Directors. Please click on the link to the pdf file which provides all the information you will need or contact Ruben Antilla, Election Chair, directly at rantilla@verizon.net. (Apr 07, 2017) Steve started playing as a kid when his dad would go to the club, he would hit the ball around in between their games and then try to get friends to play when they were on break from school. He played off an on until he was around 26 or 27, when his wife had a co-worker that wanted to play so Steve and he started to play on a regular basis. Soon after he was introduced to some other people that were playing at the club all the time and they were also tournament players. John Winings talked Steve into playing his first tournament, which was in Merced. He has been hooked ever since. He currently plays in either Open/Elite or the 50+ divisions. As the Racquetball Director at Twin Arbors he runs two tournament/shootouts a year, 2-3 leagues, clinics and junior classes. Over the years he has worked closely with John Ellis running IRT, LPRT, CPRT and WOR Champs tournaments. Steve thanks his dad for introducing him to the game, John Winings for teaching him the game, Barbara Tibbons for getting him involved in running events and at the state level and last but not least, John Ellis and his parents Dave and Pat for all their help and passion that they give back to this great sport. (Apr 07, 2017) Dane Elkins recently achieved something that has only been done one other time in the 30-year history of the High School National Championships. Dane not only won the Boys #1 Singles but also partnered with Jared Anwar to win the Boys #1 Doubles and Atossa Rejaei to win the Mixed #1 Doubles. With his #1 Gold in the Singles Dane was appointed to the 2017 US Junior National Team. Congratulations Dane for this accomplishment and congratulations to Jared Anwar and Atossa for being great partners! (Apr 07, 2017) Over 50 young players hit the courts at Prime Time in Burlingame and Los Cab in Fountain Valley for our annual NorCal and SoCal Junior State Championships. Tournament Directors, Kim Randolph and Dorcy Norton did an awesome job ensuring everyone had plenty of play and a great time. Most went home with one of our new championship medals for their efforts. Brian Dixon the CNRA Junior Committee chairman was responsible for making these championships a success. Pictures will be posted soon. Congrats to all of the juniors!!!! !